*This post has been updated February 11, 2015. If you’ve been reading here a while, you know all about my body dysmorphia issues. My scale has been up and down so much, it should be a trampoline. From anorexia at 16 followed by the fun-filled cocaine and Taco Bell diet in my 20s, to my yo-yo struggles with comfort food addiction in my 30s, I’ve literally seen four different dress sizes cohabitation in my closet for years. I’ve been trying to eat well since my brain aneurysm diagnosis. Between that, therapy visits and moving my body more (walking), I’m realizing there’s something to this whole body-connection-thing. Having a nice figure is really just a side effect of being healthy. Captain Obvious? Is that you? Furthering that thought, having a happy attitude is really an added bonus – the sweet cherry topping – to our emotional, hot fudge sundae. If you’re mentally and physically healthy, the Happy and Hot will follow. Do I feel happy all of time, and do I walk around feeling like Cindy Crawford, circa any decade? Er, no. But more times than not, when I’m taking care of myself I’ve an extra bounce in my step, and in the right lighting, on a good hair day, after kicking back some champagne, I feel like a super model. Kind of. I’m still not where I want to be, but I’m closer than I was yesterday. For those of us in our 40s, we need to be ready to face middle-age with a healthier lifestyle. So far, it’s been a blast living in a body that can’t rally the way it did twenty years ago. 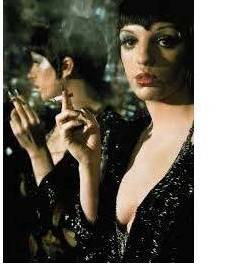 This will be the decade of Divine Decadence, like Sally Bowles in Cabaret. Without the hairstyle and cigarettes.